(Bloomberg Opinion) -- Ten thousand here, another couple thousand there. Lately, dramatic job cuts seem to be par for the course at the world’s banks. Even by those standards, though, Commonwealth Bank of Australia’s plan to trim 10,000 to 12,000 jobs is eye-popping. The lender is “secretly” preparing to cut a quarter of its workforce in coming years, and shutter up to a third of its almost 1,000 branches, The Australian reported. 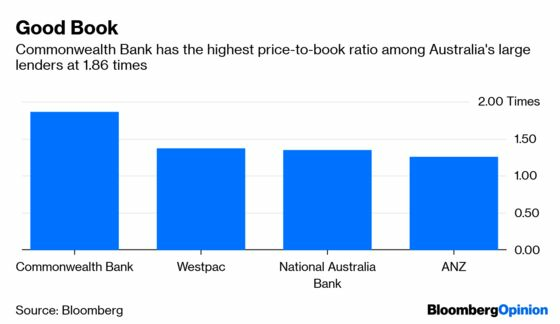 What’s curious is that Commonwealth – the biggest of the four banks that dominate deposit-taking and lending in Australia – is acting an awful lot like cornered prey when things don’t seem so bad. For one thing, the lender got off relatively scot free from a government-appointed Royal Commission investigation into the financial industry’s shady practices. This is, after all, a bank whose grow-at-all costs strategy had its advisers charging ongoing service fees to dead clients (not unlike Well Fargo & Co.’s fake customer account fiasco). Meanwhile its insurers refused to pay out claims to heart-attack and breast-cancer survivors who had taken out policies covering those conditions. 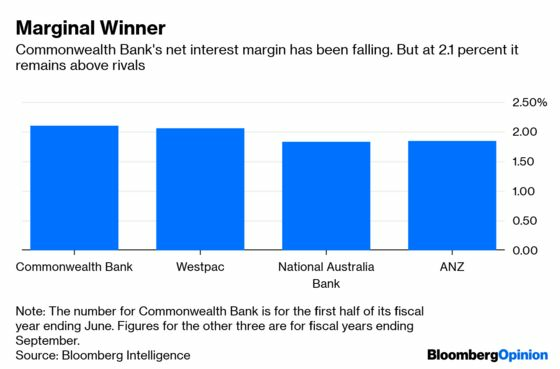 For another, Commonwealth Bank is head and shoulders above its rivals on two crucial fronts: price-to-book and net interest margins. This is a signal that investors, at least, don’t see its employee count as an issue. That’s not to say there isn’t fat to be trimmed. Commonwealth Bank has the largest workforce among Australia’s big four banks, and the second-lowest sales-per-employee ratio in the most recent half-year reporting period, according to data compiled by Bloomberg. But cutting a quarter of its employees seems excessive. Not to mention all this will become a political hot potato in general election campaigns that began this week. So why is Commonwealth acting like Deutsche Bank AG and Mizuho Financial Group Inc.? The German lender is in restructuring mode, and could see 30,000 jobs at risk if it merges with Commerzbank AG. Japanese megabanks, meanwhile, not only face aging demographics, but also negative interest rates. The best explanation probably lies in Australia’s real-estate market, which is seeing the worst slump in a generation. As the country’s biggest mortgage lender, Commonwealth Bank’s prospects are looking increasingly dim. More than any of its peers, the bank rode a two-decade housing boom to glory; in the process, it went from a small-time local player to, at one point, one of the world’s most profitable banks. Lenders like Commonwealth Bank were once the envy of the world. That wave is now breaking. Circumspect investors may do well to follow the leaving staff.